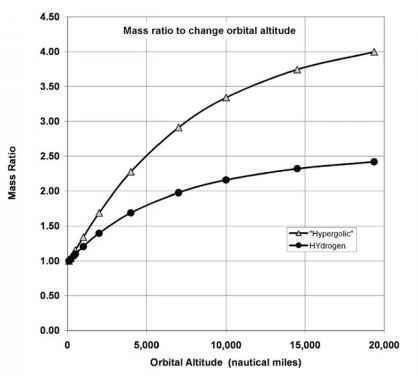 Orbital Altitude (nautical Miles) Figure 3.6. Slower orbital speed means longer periods of rotation. Figure 3.7. To achieve a higher orbit requires additional propellant. change must be carried to orbit from Earth, as there are no orbital fueling stations now in orbit (see Figure 2.23 for future possibilities). So if the weight of the object to be delivered to higher orbit is one unit, then the mass of the system in LEO times the orbital altitude mass ratio is the total mass of the system required to change altitude. To achieve GSO from LEO with a hypergolic propellant the mass ratio is 4, and for hydrogen/oxygen it is 2.45. As an example, a 4.0-ton satellite to GSO requires orbiting into LEO a 16.0-ton spacecraft as an Earth launcher payload. If that payload represents a 14% fraction of the launcher empty weight, then the launcher empty weight is 114.3 tons and, with the typical mass ratio to reach LEO of 8.1 for an all rocket system, the total mass at liftoff is 925.7 tons. So it takes about 57.8 tons of an all rocket launch vehicle to put 1 ton in LEO using an all rocket launcher system, and 231 tons of the same all rocket vehicle to put 1 ton in GSO. To achieve GSO from LEO with a hydrogen propellant the mass ratio is 2.45, so a 4.0-ton satellite to GSO requires orbiting into LEO a 9.8-ton spacecraft as an Earth launcher payload. If that payload represents a 14% fraction of the launcher empty weight, then the launcher empty weight is 70.0 tons. For an ejector ram/scramjet-powered launcher that flies to Mach 12 as an airbreather, the mass ratio to reach LEO is 4.0 and the total mass at liftoff is 280.0 tons. So it takes about 28.6 tons of launch vehicle to put 1 ton in LEO for an ejector ram/scramjet-powered launcher that flies to Mach 12 as an airbreather and about 70 tons of the same ejector ram/ scramjet-powered vehicle to place 1 ton in GSO. The advantage of airbreathing propulsion is than it requires a launcher that has an empty weight 39% less than the rocket launcher, and a gross takeoff weight that is 70% less for the same payload. The primary reason is rather obvious, since the airbreathing launcher carries some 210 tons of propellant rather than the 811 tons of propellant the all-rocket carries to achieve LEO speed and altitude; it does not use the large mass of oxidizer needed by an all-rocket system, replacing most of it with external air. The advantage of airbreathing propulsion is that less propellant and vehicle resources are required.